Returning to their base of operations, an anonymous office in a shabby neighbourhood, she finds the bloodied body of her boss, and friend, DI Pete Copperthwaite. He's been executed - a single shot to the head. In the aftermath, it seems someone in the Met is determined to make sure that blame for the wrecked operation falls squarely on Con's shoulders. She is cut loose and cast out, angry and alone with her grief... right until the moment someone also tries to put a bullet through her head. 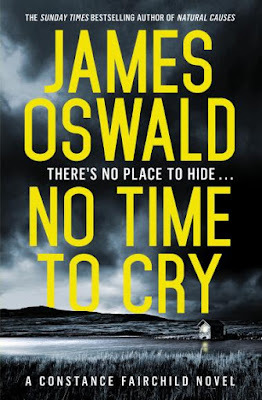 After eight books in his very good Inspector McLean series, Scottish author James Oswald takes crime readers in a new direction, with both a new series character and a new location: London instead of Edinburgh. There's no need for any trepidation from long-time fans, as Oswald demonstrates that he's a quality storyteller regardless of the hero or setting, not just an author wedded to a popular character. We're dropped right into it straight away, as cop Constance (Con, never Connie) Fairchild goes to meet her boss at an office set up for an undercover operation, only to find him executed. Who compromised the operation, and how did their rather routine undercover sting turn so deadly? Whatever the unanswered question, Con is quickly on the outs with her police colleagues who blame her. Unfairly so, it seems - immediately putting readers on-side with the embattled young detective. Isolated and seeming to be set up as the scapegoat, Con has to uncover just what went wrong and who is behind it all, as she deals with the death of her closest friend and confidante in the force. There is a lot to like about the first in what will purportedly be a new series from Oswald. While the London setting could be Anywhere-City, UK and doesn't have such a strong sense of specific place as his Edinburgh-set novels, the various settings are still well-evoked. We feel the world in which Con operates, the people and places that make up her life. There's a robust tension throughout, a strong narrative drive that pulls readers along and keeps the pages quickly flipping without feeling thin or underdone. From the beginning, you feel you're in the hands of a good storyteller, and readily surrender to the world Oswald has created without ever feeling 'pulled out of the story' by some of the flaws that can mar some other popular authors' work. The jewel in the crown of NO TIME TO CRY, however, is undoubtedly Con Fairchild. She has the prerequisite past demons of so many crime fiction cops, and doesn't get on well with her bosses and colleagues, but still feel fresh rather than cliched or derivative. Much of that may be as much to do with Oswald's storytelling rather than any specific point-to differences in her resume or character. She's courageous, outspoken, and comes from a different background to most of her colleagues. She doesn't need to be a cop as a career, but has a very strong sense of justice that drives her. She's loyal but not a lapdog, fierce but also flawed and vulnerable at times. Just a very good, layered, character. I look forward to seeing where Oswald takes us next. For now, NO TIME TO CRY is a heck of a good series-starter and well worth a look.